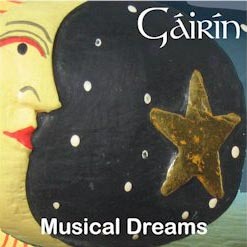 A collection of original songs and tunes by Gairin, plus a bonus! Inspired by dreams, the music is sometimes dreamy and then at other times the music is altogether bouncy! Sometimes very adult and then again childishly playful. Wanting to include all the songs Mary Kay had written at the time, plus a few of Tom's tunes too, we packed 69 minutes of music into this little disc! On this CD the charming and uniquely blended vocals mix with folk mandolin, guitar, Irish bouzouki and accordion. This husband-and-wife folk duo got their start performing at Renaissance faires in California and Nevada, before they turned their attention to writing their own music. Find out more on the Gairin Music web site.